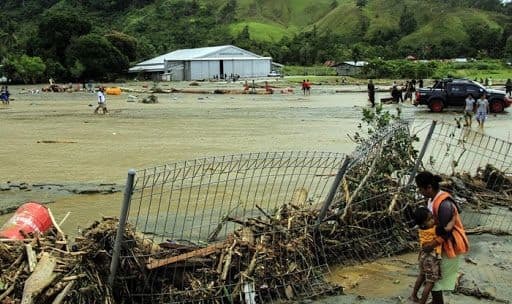 The floods in Sentani, near the provincial capital of Jayapura, were triggered by torrential rain and subsequent landslides on Saturday, and also left 116 injured. Jakarta: At least 77 people have been killed by flash floods in Indonesia’s eastern Papua province, an official said, as rescuers raced to find more victims of the disaster. Dozens of homes were damaged by floodwaters, national disaster agency spokesman Sutopo Purwo Nugroho said. “The number of casualties and impact of the disaster will likely increase as search and rescue teams are still trying to reach other affected areas,” he added. “The floods were likely caused by a landslide.” The waters had receded but officials were still trying to evacuate people. “The joint search and rescue teams are still doing evacuations and not all affected areas have been reached because of fallen trees, rocks, mud and other material,” Nugroho said. Uprooted trees and other debris were strewn across muddy roads, while at Jayapura’s small airport a propeller plane lay partly crushed on a runway. Papua shares a border with independent Papua New Guinea on an island just north of Australia. Flooding is not uncommon in Indonesia, especially during the rainy season which runs from October to April. In January, floods and landslides killed at least 70 people on Sulawesi island, while earlier this month hundreds in West Java province were forced to evacuate when torrential rains triggered severe flooding.